Chinese newcomer Luping Wang's pristine features were a familiar sight throughout the Spring/Summer 2015 collections as she debuted as an exclusive at Burberry Prorsum followed by flurry of bookings for Just Cavalli, Marni, Dolce & Gabbana, Chloé, Hermes, Alexander McQueen, Stella McCartney, and Dior. Discovered two years ago in a shopping mall in her native Guangzhou, Luping's childhood dreams of modelling have rapidly come to realisation with the formidable backing of mother agency SMG Model Management, Premier Model Management, Oui Management, and Wilhelmina Models. Following eighteen months of careful development, strategic placement, and industry experience gained while modelling in Singapore and China, Luping was primed to make her international runway debut at the Spring/Summer 2015 shows. The graceful 178 cm tall beauty logged a gilded trail via twenty-seven blue chip show bookings and is well on her way to achieving a supermodel status in China with editorials for local editions of Vogue, Harper's Bazaar, Elle, Manifesto, Cosmopolitan, Marie Claire, and Numéro. Luping's unconventional beauty, wide-set almond-shaped eyes, and distinctive high forehead have cast a spell on the fashion world whilst redefining preconceived notions of Asian beauty. Luping's stunning versatility is in evidence on the runway in a myriad of incarnations whether as part of Burberry Prorsum's collective of multi-ethnic beauties, Alexander McQueen's Japanese-inspired warrior goddess, or as the embodiment of French chic at Hermes. At the recent Couture collections, Luping's ascension continued with appearances at Chanel, Giorgio Armani, Alexis Mabille, and Viktor & Rolf. Off the runway, Luping is equally captivating with an natural ebullient personality and a killer street style. In between castings for the Fall/Winter 2015 season, Luping chatted exclusively with IMA about her spellbinding Spring/Summer 2015 debut, bonding backstage with Chinese top model Fei Fei Sun, what it means to represent, and her love of food, ping pong, and basketball. Inoubliable Model Army (IMA): Hi Luping, thanks for chatting with IMA! Congratulations on a stellar debut at the Spring/Summer 2015 collections. How are you feeling now that you have had time to decompress from the shows and to realise the full extent of your achievements this past Fashion Week? Luping Wang (LW): This was my first season and I feel like it was a good start. I have experienced a lot of wonderful things... meeting talented designers and stylists that I only used to read about in magazines or see on TV. 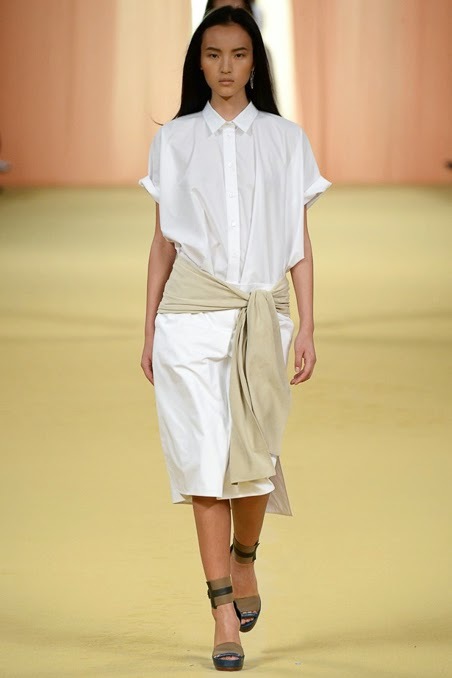 When I was casting for Hermes, Christophe Lemaire and his assistants taught me how to walk the Hermes way. This process and attention to detail was striking. I was learning something new and when it was happening, I realised how something as simple as walking could be categorised oddly, wonderfully as a "once in a lifetime" experience. IMA: As a relatively new face to modelling, would you mind sharing your backstory with IMA's readers? LW: I was in a shopping mall and a local agent scouted me. I couldn't believe it at first, but he kept telling me I had a good chance to be successful so I decided to give it a try. IMA: This season you debuted in London as an exclusive at Burberry Prorsum. Describe the process that was involved in the Burberry casting and when did you find out you had confirmed for the show? LW: The casting was extremely organised. My New York agency and my Chinese mother agency coordinated with my European agents to make it work. When I arrived, the casting line was super long and I released that models had come from all around the world to be considered. Everyone looked so nervous but during this whole process, I reminded myself that if nothing happened that this would be a great experience and I had gotten to fly to London to see this city for free. IMA: The Burberry Prorsum exclusive set the wheels in motion for an avalanche of bookings for Just Cavalli, Costume National, Ports 1961, Marni, Dolce & Gabbana, Dior, Viktor & Rolf, Chloé, Stella McCartney, Alexander McQueen, and Hermes! What were your most memorable and precious Spring/Summer 2015 moments? LW: I would say a memorable moment would be walking for Burberry since it was my first one. All of the shows were spectacular... and to walk for brands I know like Hermes, Dior, Alexander McQueen, and Dolce & Gabbana seemed unreal. I also enjoyed meeting the casting directors and then getting to seeing them again in different countries and connecting with them. It was like seeing a different friend in a different place each time! IMA: The month long fashion frenzy that is Fashion Week is a real test of mental and physical stamina. How did you prepare in the lead up to the shows and what was the most valuable advice you received from your agents that helped you throughout the show season? LW: I really enjoyed my first season, I wasn't ever really feeling tired, just excited. One of my agents from NY was with me every day and since he is from China too it was great company. He took the time to explain the background of each casting director, each designer, why each show mattered and why the casting process was different from China. It was about quality not quantity. Plus I had a driver, French, very nice and kind. He always brought me water and food which made a big difference on busy days. IMA: The casting process for shows can be particularly intimidating especially for newcomers with so many stunning girls vying for limited runway slots. What was your approach heading into castings and what advice would you offer to make a positive impression? LW: Be confident, SMILE, and have good energy because after having cast so many models, if you can present a positive impression to casting directors than they will remember you. You should be energising them and lifting their spirits with your enthusiasm when you walk in to meet them. IMA: Did you have an interest in modelling prior to entering the industry and are there any modelling figures who you particularly admire and whose careers you wish to emulate? LW: Yes, I'm not afraid to say that I always wanted to be a model because it's a job that allows you to travel all around the world and while you are doing it, try all the amazing food! I admire Fei Fei Sun. She is such a cool girl. When we were together backstage at the Dior show, she helped me fix my dress. At the Hermes show, she explained to me why we needed to walk twice for the show. She is an example of a famous top model who took the time to explain the little things and it made a big impression. It just shows how kind another model could be without any sign of ego or competition. IMA: You've been featured on models.com and a number of street style blogs as a result of your great sense of style. Have you always a had an innate interest in fashion and how would you describe your street style? What are your current wardrobe essentials? LW: Simple and comfortable are always the key for my wardrobe 'policy'. Mix and match designer and street. Choose what you love and be authentic. A cool pair of trainers goes a long way! 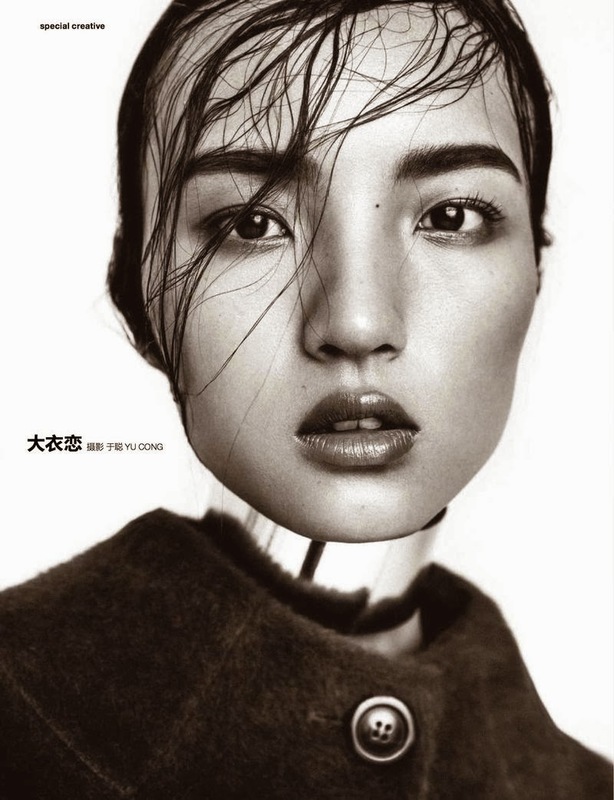 IMA: In recent years the rise of the Asian supermodel has been championed by the likes of Liu Wen, Sui He, Ming Xi, Shu Pei, Xiao Wen Ju, and many more. Was modelling a dream of your's growing up and what do your friends and family think of your career? LW: I think modelling is something that many girls dream of doing... the fact that it can become a reality is what seems impossible at the time when you are back in your own small hometown. After I got started my parents were very supportive. Sometimes though, I am more concerned about how they are doing in China rather than how I am doing travelling around the world. IMA: Modelling can at times feel like a 24/7 all consuming existence. How do you unwind after hours, and what are your keen interests and passions beyond modelling and fashion? LW: I am Chinese and of course, a huge fan of ping-pong and basketball! Other passions include being adventurous in the culinary arena and perfecting my English. I am not afraid to speak and practice, and I love meeting people and conversing. IMA: Wilhelmina Copper (the founder of your NY agency Wilhelmina Models) was a high fashion model in the 50s and 60s and was also a pioneer in promoting diversity in modelling. Do you feel that models of colour were adequately represented on fashion's runways this past season? LW: In China, people know the Wilhelmina name for their success with building top models from Asia and elsewhere from the very beginning. This is one of the reasons why I know I made the right choice in joining them. I did get to see other models of colour at castings (often times other girls from Wilhelmina), but when the shows actually happened many times there were only a handful of us. I think that every one of us that gets the opportunity to represent a brand on the runway has a unique moment to shift the perspective of how models of colour can fit into the idea and beauty of the brand. IMA: One of the most enjoyable aspects of the shows is the friendships forged with other girls. Did you bond with any specific girls in between castings, round the clock fittings, and the backstage madness? 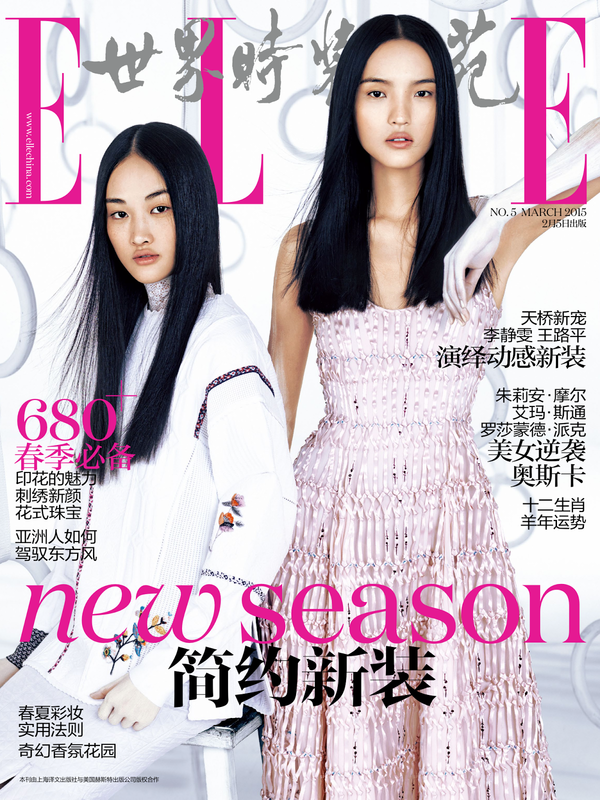 LW: Feng Qi Wen is a model that I became friends with and I can't wait to see her in NY. We met in Hong Kong, then after that again in Paris. We are from the same area in China so we share many common interests like spicy hotpot! IMA: What do you enjoy most about modelling and what are your long term modelling aspirations? LW: We get to wear these one-of-a-kind, shockingly beautiful clothes and wear them on the stage to an audience of talented, creative people. This is almost like being a celebrity and walking on a red carpet. It is not like any other thing I have experienced and the excitement of this feeling is something that I wish I could bottle. I really just want to focus on what I am doing right now, and work with my agents on building a career that allows me to do this long term. So far they have all done the right things and I am confident it will only get better. We connect on a personal level which I know will only add more enjoyment and trust to the professional collaboration. This is something that is important to me. LW: I think my fearlessness to travel and really truly enjoying the process of adapting to new cultures and languages make me unique. In a more physical sense, I think I do not necessarily look like the stereotypical Chinese beauty and perhaps this is what has helped me in castings to be memorable. Who really knows, but whatever it is, it seems to be working... and for that I am grateful.